LUMIFLON® LF710F by AGC Chemicals (Americas) is a fluoroethylene-alkyl vinylether alternative copolymer designed for powder coatings. Exhibits weathering resistance, chemical & water resistance and outstanding UV (ultraviolet) stability. 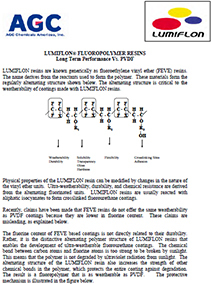 LUMIFLON® LF710F can be crosslinked with standard aliphatic blocked isocyanates. 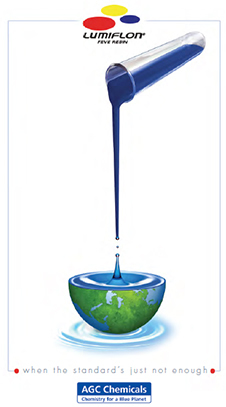 It is a solvent-soluble resin that is insoluble in water. Available as translucent pale yellow flakes. Suitable for high or matte finish powder coatings. Potential applications include architectural (window frames & construction panels) coatings, heavy equipment coatings, and clear coats for automotive and aerospace applications. Listed on the TSCA (Toxic Substances Control Act) inventory.